Although our Falcon JK/JKU Series 3 Piggyback Shock Absorbers (Series 3.4 Remote Air Adjust, Series 3.3 Fast Adjust, Series 3.2 Adjustable, Series 3.1) are designed to take a beating with their nearly indestructible hard anodized 6061-T6 aluminum construction, we offer bolt-on Falcon JK/JKU Heavy-Duty Rear Shock Skid Plates to give the serious off-roader that extra peace-of-mind when leaving civilization behind. These Heavy-Duty Rear Shock Skid Plates for the JK Wrangler and JKU Wrangler Unlimited are constructed from 1/4” cold rolled steel. 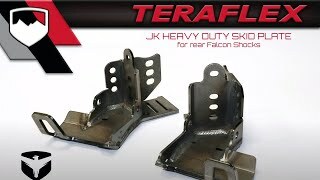 Unlike our standard Falcon JK/JKU Bolt-On Rear Shock Skid Plates, we left our Heavy-Duty Rear Shock Skid Plates raw for Jeepers who want to weld them on for more strength (welding not required). These skid plates also feature the same Eco-Guard mounting hardware found on our Falcon shock absorbers. • Requires cutting of stock lower shock mount. • Mounting at Level 2 or Level 3 may affect overall rear axle travel, causing the axle to droop further, which may cause the spring to fall out of place.